Now in its second month since the Saudi-led war coalition of Arab states launched a military campaign against Yemen, Yemenis are still facing the horrors of war in the country, while others are facing hardship and humiliation seeking refuge abroad. These are some of the stories that have been shared on social media that would not be heard otherwise. Thousands of Yemenis are stranded abroad, unable to return home, since Saudi-led coalition forces started bombing the country on March 26. Another 300,000 are internally displaced in Yemen, with little to no help. Yemenis who were out of the country for medical treatment and other reasons when war broke out in their country, were prevented from returning to their homeland for a whole month, by order of the war coalition on Yemen. The imposed embargo on Yemeni air, land and sea, caused Yemenis to be stranded overseas. With new visa requirements imposed on them by countries that previously welcomed them, and no resources to support them. Arab coalition forces have been pounding Yemen with airstrikes since March 26. Their assault has not been limited to military sites or the main target of the campaign, the Houthis, who had taken control of Yemen's capital Sana'a in January. There is also massive destruction in the beautiful southern port city Aden, where the Houthis have been launching their response along with militias loyal to Yemen's former president, Ali Abdulla Saleh, who was forced to step down after three decades in power, following popular protests in 2011. Fahd Aqlan, a Yemeni who has been living in Egypt for eight years and considers it his second home, was in Yemen to attend his brother's wedding before the war broke out. He writes on his Facebook page the story of his agonising and humiliating trip from Yemen back to Egypt through Djibouti in four parts. The first part describes how he struggled to get to Taiz safely by land after his flight landed in Aden, with the Houthis advancing, just a few days before the airstrikes began. 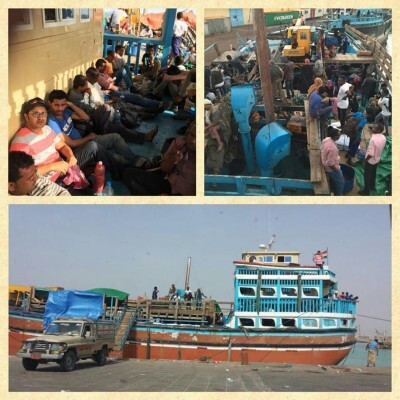 The second part was about planning his trip to leave Yemen back to Cairo through the only means possible, by sea from the port city of Mokha, on a boat that transports herds, to Djibouti and from there on to Cairo. I arrived home not believing that everything is finally over and I slept like I have never slept before. A few days later I went to the Mogamma (an official building in Egypt) in Tahrir to legalise the situation of my stay and that of my family, they put on their passports a residency for an indefinite period and on mine a temporary stay for only six months because I was not in Egypt when the laws changed! These stories are just two examples of lucky people, who had the means and managed to get out safely. Others face harsher and more terrifying experiences. With a war tearing their country apart and conditions imposed on them beyond their power, Yemenis are forced to face hardship and humiliation as refugees. A heartbreaking photograph was posted on Twitter of an old Yemeni man sleeping on the sidewalk in Cairo. Most probably who went to Egypt for medical treatment and was humiliatingly stranded in the streets of Cairo after his money ran out. #Saudi  humiliates the #Yemenis  by sanctions and at borders. We know families that are waiting for days in Tiwal border town to get access. When will Yemenis be treated with dignity, let alone as refugees by other Arab and neighbouring countries?